If you’re the type of person to like SpinArt, then you should take a look at Yves Schmid Dornbierer’s little art app, CosmicPainter. It possesses the same concepts as SpinArt–i.e., laying down colors on a moving canvas–but presents and carries it out in a different way. You’re still “painting” onto a moving canvas, but instead of stopping the spin to see what you’ve created, CosmicPainter keeps the animation as part of the art. For the flood fill under Tools, make sure to tap the bucket icon after choosing your color, otherwise nothing will happen. Remember, in addition to moving the canvas, you can also scale and rotate with the hand icon. In the Brushes, you can choose the size of the brush using the + and – icons; tap the last icon on the top row to change the shape of the brush. Rotation and scroll speeds can be adjusted in Motion, and if you don’t like what’s been done, you can snap every motion back to a standstill using the top right icon with the two arrows pointing at each other. After you’re satisfied with your creation, you can save your animation to load for next time (the two icons in Files, respectively). CosmicPainter has the huge potential to be incredibly fun and creatively amazing, but only if you’re willing to put in the effort. The controls take some getting used to, and you might get dizzy from trying to manipulate motion speeds for the first few times (especially if you have both rotation and scroll going on at the same time)–I recommend giving your eyes a break once in a while. This is better suited for the iPad, as get to see more of your design flashing by your eyes. 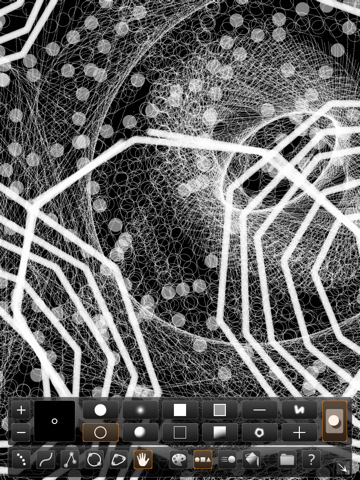 All in all, CosmicPainter is a great artistic challenge for $1.99, only for those who are up to it and preferably have an iPad as well. AppSafari review of CosmicPainter was written by Julie Guan on November 5th, 2010 and categorized under App Store, Art, Fun, iPad apps, Universal. Page viewed 3528 times, 2 so far today. Need help on using these apps? Please read the Help Page.